Sudan government forces are pushing south into the heart of rebel territory in South Kordofan, driving out tens of thousands of civilians as the fighting season reaches its peak. Around 70,000 civilians have been displaced in the past month alone. Government forces are making one final push to capture territory before seasonal rains make troop and vehicle movement impossible. After nearly a month of blanket shelling and pillaging in nearby Rashad and Abbasiya, a Rapid Support Force unit captured Abri, just south of Delami on April. The RSF unit is comprised of Arab Militias from North and South Kordofan under the command of the National Intelligence and Security Service. Abri is a northern stronghold of the SPLA-North – part of the Sudan Revolutionary Front coalition. The town was taken by rebel troops and was under SPLA-N control from the beginning of the war 2011. The town sits around 80 kilometers north along the main road from Kauda, the capital of rebel held territory in the state. While SPLA-N leadership remains confident they can defend the area, losing Abri is certainly a major blow after a season of rebel advances. On April 27 the unit moved to Umm Barmbeita and began shelling Tonguli, Deri and Sabat. The shells in Tonguli killed 3 women. The two day battle began around 5pm on April 28. After a two day battle which involved tanks, foot soldiers, fighter jets, bomber-planes and artillery, the Sudanese Military announced they had taken control of the area. Eyewitnesses and sources across the state say the RSF troops have been massing around the state since late March. Forces have been seen in Abu Jubeiha, East of Kadugli, Near Talodi, Al Roseires, Alehemer, Um Barmbeita and several other locations. Some troops moved up to Rashad and Abbasiya counties in mid-April and began shelling the area. According to the Rashad County Commissioner, more than 52,000 fled their homes once the shelling began. The bombing was so intense the commissioner himself was forced to flee Rashad County. Just days ago, the attacks on Delami County – which contains Abri – began. In addition to Abri, 3 other villages fled the fighting, with many civilians sheltering in caves nearby. Humanitarian sources in the region say at least 4 children were killed in the shelling in Delami County. The SPLM-North’s negotiation team spokesman, Mubarak Ardol said the recent fighting has made the negotiations “unstable” but said they would continue. The attacks in Rashad, Abbasiya and Delami Counties are only the beginning of large-scale offensive launched by the government to break SPLA-N control over the heart of the state. 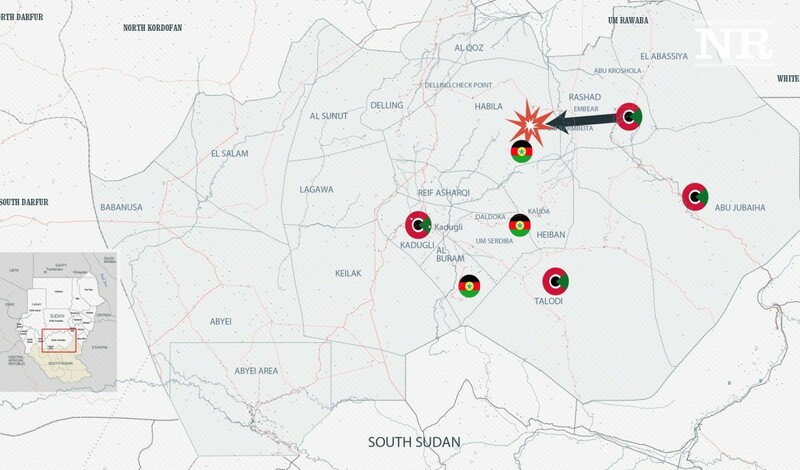 This offensive follows a first failed attempt to penetrate SPLA-North lines in January. Government troops are now massed in Kadugli, Heglig, Talodi Abu Jubeiha and Delami County, effectively surrounding the areas of rebel control. It appears only a matter of time before Khartoum launches an assault to engulf the whole of South Kordofan in war.